Last week, the U.S. Interagency Council on Homelessness elected Shaun Donovan, the Secretary of the Department of Housing and Urban Development, as its Chair for 2014, transitioning from Veterans Affairs Secretary Eric K. Shinseki. After assuming the gavel, Secretary Donovan praised the Secretary’s Shinseki’s leadership on the Council. 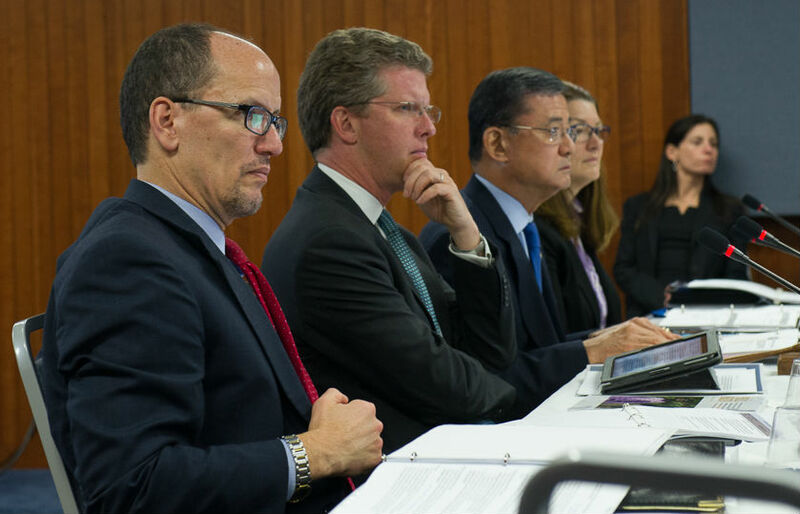 The Council also elected Tom Perez, the Secretary of the Department of Labor, as Vice Chair for 2014. The Council meeting was attended by Assistant to the President and Director of the Domestic Policy Council, Cecilia Muñoz; HHS Administration for Children and Families Acting Assistant Secretary, Mark Greenberg; and representatives from all 19 Federal agencies that are members of the Council. In addition to electing its officers for 2014, the Council discussed progress on Opening Doors goals based on the results from the 2013 Point-in-Time Count, and community-level efforts to end youth homelessness. Mark Johnston, HUD’s Deputy Assistant Secretary for Special Needs of the Office of Community Planning and Development, provided the Council with an overview of results from the last Point-In-Time (PIT) count, which were released in November, 2013. He shared that on a single night in January 2013, there were 610,042 people experiencing homelessness in the nation. He also provided an overview of progress on the Opening Doors population goals for Veterans, people experiencing chronic homelessness, families, and youth. The Council also had the opportunity to hear from experts in two communities about how they have been using USICH’s Framework to End Youth Homelessness. USICH’s youth framework has and will guide the community’s work, Strnisha said. Megan Gibbard, the Homeless Youth and Young Adult Project Manager with the King County Committee to End Homelessness, provided an overview of her community’s systematic approach to end youth homelessness. Their work starts with a data strategy, which aims to improve multiple efforts to collect and use data to inform their work. Based on the local data, the community selected four goals, including reducing the disproportionate representation of lesbian, gay, bisexual, transgender, and questioning youth and youth of color, and reducing young people’s return to homelessness. Highlights of King County’s work so far include the collaborative review of data, simple screening at every front door for every young person, a shared, common direction, more than 4 million dollars of new resources from public and private funders, and a deep community commitment to get youth and young adults off the street. Following the presentations was a robust discussion about the work being done in Cleveland and King County. Learn more about the panelists and these community efforts by reading the expert briefs prepared for the Council by the panelists with Katie Hong from the Raikes Foundation. The Council remains dedicated to preventing and ending youth homelessness, and all forms of homelessness, as established in Opening Doors.